Ramirez Loafs, Gonzalez Fumes, Florida Sinks? Is he or isn’t he injured? Does he or doesn’t he care? The questions rage in South Florida after Marlins shortstop Hanley Ramirez accidentally kicked a baseball 100 feet into the left-field corner yesterday, then lazed after it while two runners scored. Ramirez had fouled a ball off his left ankle an inning earlier, which may have hindered his efforts . More pertinent to the Code is something Gonzalez followed closely—the rule mandating that, with the exception of pitchers or in the case of injury or a double-switch, a player should never be removed from a game in the middle of an inning. Gonzalez waited until Ramirez returned to the dugout after the frame. With just a few words of discussion, he then sent him to the clubhouse, inserting Brian Barden in his place. Had Gonzalez opted to act sooner, he wouldn’t have set precedent. In 1969, Mets manager Gil Hodges pulled left fielder Cleon Jones in the middle of an inning after a lackadaisical effort, not unlike that from Ramirez. In the Mets’ case, however, there were other mitigating factors. Jones had been playing on a sore hamstring on a muddy field; his entire team was likely beaten down by the fact that to that point in the day—late in the second game of a double-header—New York had been outscored by the Astros, 24-3. The play in question came on Houston’s sixth hit of the inning, in addition to two walks. When Hodges emerged from the dugout, however—hands in pockets, head down—he first appeared to be headed toward the mound. Then he veered toward shortstop, then toward Jones in left. (This led to speculation that he merely got lost on his way to speak to pitcher Nolan Ryan.) Upon reaching Jones, Hodges put his arm around the left fielder, and they returned to the dugout together. Although Hodges clearly violated an unwritten rule with the move, he upheld another one after the game, pinning his decision on Jones’ injury and saving personal blame for a closed-door meeting with the player. This sort of verbal sortie is not undertaken by a manager noticing for the first time that his best player has failed to give a sufficient effort. This is a tactic taken by a manger who, having tried (and apparently failed) to reinforce this value with said star player, has given up the ghost and opened up whatever avenues of attack he finds at his disposal. Gonzalez was clearly frustrated. He was also wrong. Now he has a disgruntled superstar on his hands, and a roster full of players who might be wondering whether he might do the same to them should things turn sour. While Gonzalez is a capable manger, it didn’t take long for Ramirez to home in on his primary weakness in regard to player relations: “He doesn’t understand (playing hurt)—he never played in the big leagues,” Ramirez, who is signed through 2014, told the Post. Perhaps it would have come to this anyway, even without Gonzalez’s public displays of frustration. Media scrutiny, however, rarely improves caustic situations. After Hodges publicly backed Jones after the incident in ’69, the Mets went 45-19 through the end of the season, and won the World Series. The Marlins, on the other hand, are officially on the cusp of team-wide disruption. Expect a closed-door meeting soon. Update: Ramirez didn’t do much to help his cause with his comments the next day. Update II: Ramirez apologizes, the Marlins move on. Yeah, this is a situation that can likely get pretty ugly. Having this war of words through the media hardly ever works, short term or long term. Just ask Scott Rolen and Tony Larussa. It’s really disgusting, as a fan, to see a player of any caliber pull a stunt like that. This is true. In 1998, Cox pulled Jones in the middle of an inning after he loafed after a fly ball, allowing it to drop in front of him. If there’s any hope for Marlins fans, it’s that Ramirez will respond to the challenge like Jones did. 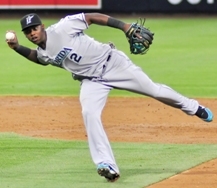 Cox’s maneuver lit a fire under Jones; with new intensity, he quickly became the best defensive center fielder of his generation. If I remember correctly, Greg Maddux was pitching when Jones loafed on that hit, so pulling the kid served two purposes. You have done it again. Great article!